This house is regarded as one of the last, and possibly the finest, of Glebe’s large houses set back in spacious grounds. 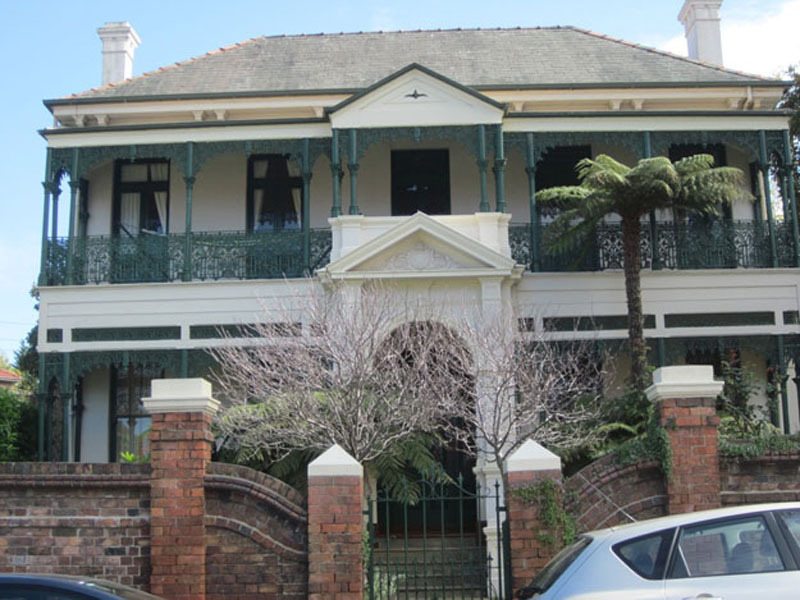 It is a two-storeyed stucco residence with a slate roof, stately verandahs and an arched entry with pediment. Note the classical chimney stacks, corbelled eaves and the profusion of highly decorative cast iron. It was the residence for a number of years of Joseph Leeds (d 1897), an auctioneer and stock and station agent. In 1914 the building became a Congregational Theological College. In recent years it formed part of the NSW College of Nursing. It is now in private hands. 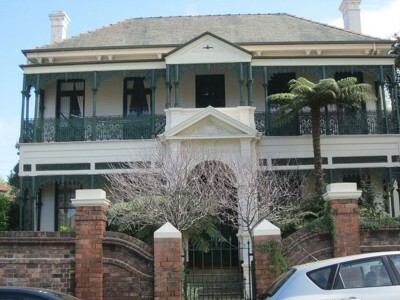 This street was named after the original Hereford House, one of the very earliest buildings in Glebe, completed in 1829 after the first (1828) subdivision of the area. The original Hereford House was demolished in the late 1960s. In the 1880s, Hereford Street contained a number of elegant villas such as Rosebank(c1832; later additions in the 1870s) (which can be seen nestled behind the Valhalla),Kinrara (1877) (at No.45), the new Hereford House(1874) (at No.53) and Glenwood(architect John Verge, sadly demolished, which stood near No.57). Definition: Corbel: a supporting projection of stone, wood, etc, on the face of a wall. Definition: Pediment: a decorative low triangular gable with a projecting cornice, especially over a portico or porch.